The ideal pair of shoes you’ve found, look extremely beautiful and the shine is extremely stylish. They,in fact, look so good that you could go to war for them. They are the best, not only because they look good, but that you and they would look very attractive together. You rush to try them on, but as soon as you put them on, there comes along a problem. They don’t fit. What do you do now? You can’t leave the perfect shoes just because they don’t fit. What you’d want to do is stretch the toe box of the shoes. i. Get a Zip-lock bag or multiple ones. Just make sure they are the “freezer strength” kind. Fill them up with water until they’re half full, remove all the air.Make sure they don’t leak! ii. Put the bag (or bags)ensuring that you have snugged the water bag(s) into the shoe. Especially into the place that you want to stretch. iii. Put it in the freezer, until it is completely frozen. Depending upon your freezer this may take anywhere between 4 to 8 hours. iv. Take them out and remove the water bags, your shoes are bigger now. But if they still don’t fit, repeat the steps again. These help preserve the shape and size of the shoe and prevent moisture from shrinking the shoe. You can buy these online easily, and there are versions that come with the ability to be adjusted according to the size of the shoe. However, if you don’t want to go for a shoe tree, and want an “at home remedy” instead, then you can stuff the shoe with rags. Any rags would do as long as the shoe is completely stuffed. • The simple stretcher is operated by a single knob, this can increase the length of your shoe if the leather is pressing a bit hard on the toenails. • Two-way stretcher, you know you need this if your biggest or/and smallest toe hurt a lot after a long day. This stretcher not only increases the length of the shoe but can also help increase the width of the toe box. • There is a longer version of the two way stretcher available. The extra torque helps you stretch tougher leather and other boot materials. • Proper Fit Stretcher, this is the kind that can help you expand all areas of the shoes, to create the custom fit you need in order to be happy with your shoes. Sometimes none of the above methods work out for you. It may be saddening but all hopes are not lost. In this case, you can go to a professional shoe repair shop. They can do a lot more than DIY remedies, ever could, be it the toe box or any other part of the shoe that doesn’t fit right, and makes your feet numb or aching after a long day at the office. Well, these repair shops have machines that can target specific areas in your shoe to stretch and expand. You can tighten up the place that is loose and loosen up the parts that wrap too tightly around your feet. 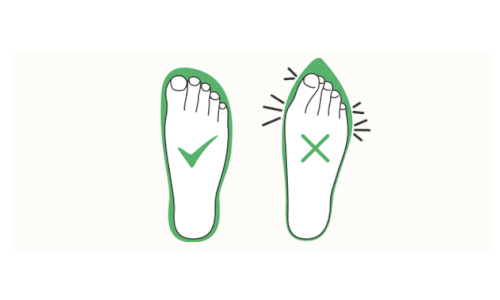 Stretch the toe box of the shoe if you feel pain after taking off those shoes. Make your shoeperfect, in order to get them fit your feet in a perfect way.